Metallic Spring Assisted 8" Pocket Knife w/ Clip Only $3.99 Plus FREE Shipping! You are here: Home / Great Deals / Metallic Spring Assisted 8″ Pocket Knife w/ Clip Only $3.99 Plus FREE Shipping! 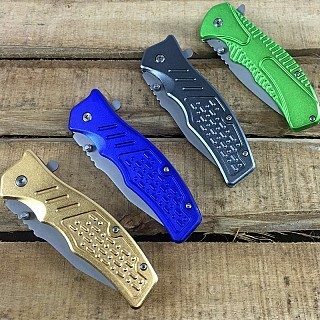 Metallic Spring Assisted 8″ Pocket Knife w/ Clip Only $3.99 Plus FREE Shipping! This is a great little tool to have around the house, the garage, the campsite or the office! This Metallic Spring Assisted 8″ Pocket Knife w/ Clip for Only $3.99 Plus FREE Shipping features a 440 stainless steel blade and a beautiful metallic finish on the 4.5″ handle that almost looks like a metal flake automobile paint job.